Researchers have announced they have developed the world’s lightest material with a density of 0.9 mg/cc, approximately one hundred times lighter than Styrofoam™. This new material redefines the limits of lightweight materials because of its unique “micro-lattice” cellular architecture. Using an innovative fabrication process developed by HRL senior scientist Dr. Alan Jacobsen, the team was able to make a material that consists of 99.99% open volume by designing the 0.01% solid at the nanometer, micron and millimeter scales. “The trick is to fabricate a lattice of interconnected hollow tubes with a wall thickness of 100 nanometers, 1,000 times thinner than a human hair,” said lead author Dr. Tobias Schaedler. 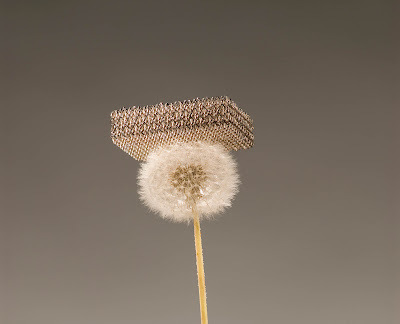 In addition to its ultra-low density, the material’s cellular architecture gives rise to unprecedented mechanical behavior for a metal, including complete recovery from compression exceeding 50% strain and extraordinarily high energy absorption. Developed for the Defense Advanced Research Projects Agency (DARPA), the novel material could be used for battery electrodes, catalyst supports, and acoustic, vibration or shock energy damping.